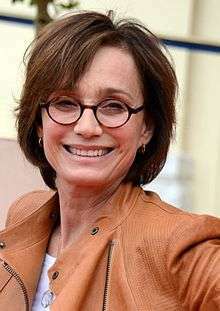 Dame Kristin Ann Scott Thomas, DBE (born 24 May 1960) is an English actress. She won the Best Supporting Actress BAFTA Award for Four Weddings and a Funeral (1994) and received a Best Actress Academy Award nomination for The English Patient (1996). For her work in the theatre, she has been nominated for the Olivier Award for Best Actress five times, winning in 2008 for the Royal Court revival of The Seagull. Scott Thomas was born in Redruth, Cornwall. Her mother, Deborah (née Hurlbatt), was brought up in Hong Kong and Africa and studied drama before marrying Kristin's father, Lieutenant Commander Simon Scott Thomas, a pilot in the Royal Navy's Fleet Air Arm who died in a flying accident when Kristin was aged five. She is the elder sister of actress Serena Scott Thomas, the niece of Admiral Sir Richard Thomas (a former Black Rod, the parliamentary ceremonial officer in the House of Lords), and the great-great-niece of the ill-fated explorer Captain Scott, who lost the race to the South Pole. Scott Thomas was brought up as a Roman Catholic. Her childhood home was in Trent, Dorset, England. Her mother remarried, to another Royal Navy pilot, who also died in a flying accident, six years after the death of her father. Scott Thomas was educated at Cheltenham Ladies' College and St. Antony's Leweston in Sherborne, Dorset, both independent schools. On leaving school she moved to Hampstead, London, and worked in a department store. She then began training to be a drama teacher at the Central School of Speech and Drama. On being told she would never be a good enough actress, she left at the age of 19 to work as an au pair in Paris. Speaking French fluently, she studied acting at the École nationale supérieure des arts et techniques du théâtre (ENSATT) in Paris, and at age 25 on graduation, was cast opposite pop star Prince as Mary Sharon, a French heiress, in the 1986 film Under The Cherry Moon. Scott Thomas at the 2009 Cannes Film Festival. Her breakthrough role was in a 1988 adaptation of Evelyn Waugh's A Handful of Dust, where she won an Evening Standard British Film Award for most promising newcomer. This was followed by roles opposite Hugh Grant in Bitter Moon and Four Weddings and a Funeral where she won a BAFTA for Best Supporting Actress. 1996 saw the release of her most famous role as Katharine Clifton in The English Patient, which gained her Golden Globe and Oscar nominations as well as critical acclaim. This was followed by a brief period working in Hollywood on films such as The Horse Whisperer with Robert Redford and Random Hearts with Harrison Ford. However, growing disillusioned with Hollywood, she took a year off to give birth to her third child. She returned to the stage in 2001 when she played the title role in a French theatre production of Racine's Berenice and on screen as Lady Sylvia McCordle in Robert Altman's critically acclaimed Gosford Park. This started a critically acclaimed second career on stage, in which she has received four nominations for a Laurence Olivier Award for Best Actress, including one win, for her performance of Arkadina in a London West End production of Anton Chekhov's The Seagull. She reprised the role in New York in September 2008. In summer 2011 Scott Thomas returned to London's West End to star as Emma in Harold Pinter's Betrayal at the Comedy Theatre. The revival was directed by Ian Rickson. Her husband was played by Ben Miles and the love triangle was completed by Douglas Henshall. In January 2013, she starred in another Pinter play, Old Times, again directed by Ian Rickson. In 2014 she appeared at The Old Vic in the title role of Sophocles's Electra. Scott Thomas also has acted in French films. In 2006, she played the role of Hélène, in French, in Ne le dis à personne (Tell No One), by French director Guillaume Canet. In 2008, Scott Thomas received many accolades for her performance in Il y a longtemps que je t'aime (I've Loved You So Long), including BAFTA and Golden Globe nominations for Best Actress. In 2009 she played the role of a wife who leaves her husband for another man in the film Leaving. In Sarah's Key (2010), Scott Thomas starred in Vel' d'Hiv Roundup, as an American journalist living in Paris who discovers that the flat her husband is renovating for them was once the home of a Jewish family who were evicted. Other recent roles include the role of Elizabeth Boleyn, Countess of Wiltshire and Ormond, mother of Henry VIII's second wife Anne, in The Other Boleyn Girl, the role of a fashion magazine creator and editor in the film Confessions of a Shopaholic, the film adaption of Douglas Kennedy's novel The Woman in the Fifth, the 2012 film Bel Ami, based on the 1885 Maupassant novel, as a love interest of George Duroy (played by Robert Pattinson). and was also seen in Nicolas Winding Refn's Only God Forgives, which premiered at the 2013 Cannes Film Festival. She was appointed Officer of the Order of the British Empire (OBE) in the 2003 Birthday Honours and Dame Commander of the Order of the British Empire (DBE) in the 2015 New Year Honours for services to drama. She was named a Chevalier of the Légion d'honneur by the French Government in 2005. Chevalier de la Légion d'honneur (2005). ↑ "Kristin Scott Thomas". BFI. ↑ "Kristin Scott Thomas is bored with being labelled an ice queen". ↑ "Kristin Scott Thomas". Yahoo Movies Canada. ↑ "Scene change". The Age. Melbourne. 12 October 2003. ↑ "Kristin Scott Thomas Biography (1960-)". filmreference.com. ↑ "Kristin Scott Thomas learning to be herself". The New Zealand Herald. The Observer. 7 March 2008. Retrieved 13 October 2011. ↑ "- Person Page 2292". thepeerage.com. ↑ Hattenstone, Simon (27 March 2003). "'I'm a horrible bully'". The Guardian. UK. Retrieved 22 June 2010. She was brought up as a Catholic and felt guilty about everything. ↑ Hattersley, Giles (21 September 2008). "Kristin Scott Thomas, haughty but nice". The Sunday Times. UK. Retrieved 22 June 2010. ↑ Anstead, Mark (10 June 2007). "On the move Kristin Scott Thomas". The Times. London. Retrieved 7 May 2010. ↑ "Chiwetel Ejiofor and Kristin Scott Thomas Win 2008 Laurence Olivier Awards". Playbill. ↑ What's On Stage.Speeches: And the Laurence Olivier Winners Said Retrieved: 5 June 2011 Archived 9 April 2013 at the Wayback Machine. ↑ Carole Horst (19 May 2009). "Rob Pattinson to star in 'Bel Ami'". Variety. Retrieved 11 January 2010. ↑ The London Gazette: (Supplement) no. 61092. p. N8. 31 December 2014. ↑ "English rose at home in Paris". The Connexion. March 2011. Retrieved 8 July 2011. ↑ "Clash de la semaine : Kristin Scott Thomas VS Sharon Stone". Excessif (in French). 1 February 2011. Retrieved 8 July 2011. ↑ "bored with being labelled an ice queen". the telegraph. Retrieved 30 June 2015. ↑ Preston, John (17 October 2005). "I'm very wary of trust". The Daily Telegraph. London. ↑ Gilbey, Ryan (27 July 2007). "The three stages of Kristin". The Guardian. London. Retrieved 7 May 2010. ↑ "Role-swapping: just a gimmick or an extra dimension to the drama?". London: The Independent. 29 January 2013. Retrieved 29 January 2013. ↑ "Old Vic stages Kevin Spacey as Darrow and Kristin Scott Thomas in Electra". whatsonstage.com. Retrieved 10 May 2014. ↑ "Kristin Scott Thomas to star as the Queen in return of the Audience". theguardian.com. Retrieved 10 January 2015. Wikimedia Commons has media related to Kristin Scott Thomas.